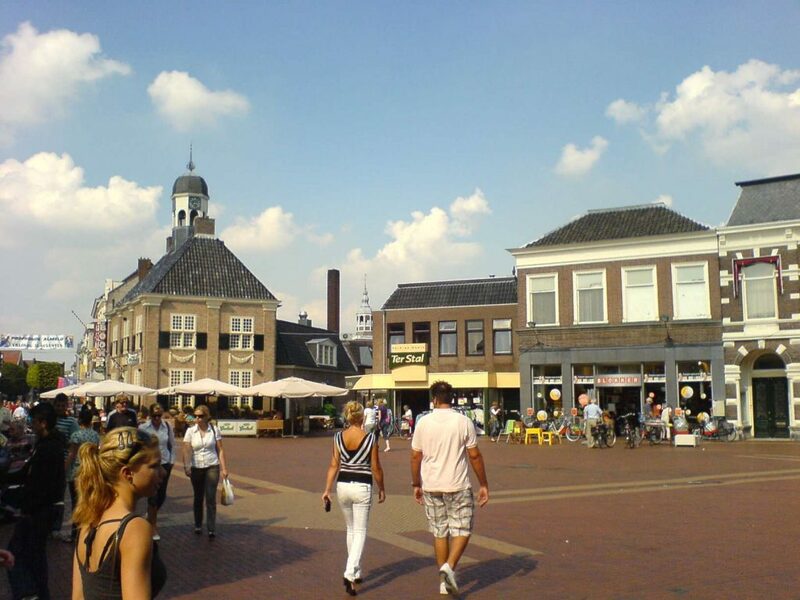 Almelo is a city in the east of Holland in the province of Overijssel. It is also the name of a municipality in the same area. The towns and cities in the municipality are Almelo, Mariaparochie, Aadorp and Bornerbroek. 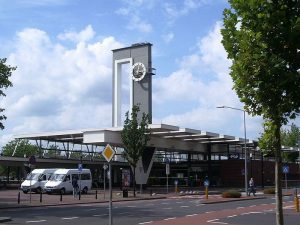 The population of Almelo is about 72,000. The area used to be known for it’s industry and manufacturing, but now has lost nearly all of this to other countries. The city of Almelo has existed since 1236 when a small gathering of houses formed at the place where a road went across a small stream and grew from there. The village must have been a prosperous place as it grew quickly enough to be granted the status of a city around the turn of the 14th century. There was a castle built in the city center in 1662 called the Huize Almelo. The castle still stands today and has some very good mosaics around one of it’s entrances. The family that built it, the Van Rechteren Limpurg, still live in the city and take part in bringing historical buildings back to life, and they also works on environmental projects. Almelo did not really take off as an industrial city until the industrial revolution happened. When the availability of machines to spin and weave cloth was brought to The Netherlands, local merchants and businessmen started to build highly profitable factories and so the fortunes of the city were much enhanced. A new wealthy elite started to build huge new homes for themselves. And the influx of money also provided investment that helped to build new canals and eventually, the railway as well. This marked a long period of prosperity for the town that was to last well into the 20th century. But eventually the owners of the textile factories were unable to compete with the cheap imports and had to close their businesses’. Some of the old buildings are still in the town, but are mainly being used as offices. There is little industry left in what was once an industrial city. If you arriving by air then you can go, either to, Rotterdam The Hague Airport, or you might go to Amsterdam Schiphol Airport. Both of these areas have excellent train connections with Almelo. But sometimes these trains can split and go in other directions, so be sure to ask when you get on the train, if it is the right part for Almelo. If you are arriving directly by train there are very good connections. You can get direct trains from Zwolle, Hengelo, Marienberg, The Hague, Schiphol, Rotterdam and Amsterdam. There are also direct trains to Berlin and Hanover. When you get to Almelo the best and easiest way to get around is by bus. There is an excellent bus service in the city, and buses are usually cheap and reliable. To use the busses you will need to buy a chipkaart which is a small plastic card that you can buy from stations, which you then pay to top up with credit. As you get on and off of the bus you tap your chipcaart onto the reader and it will automatically deduct the right fare for your journey. Another good way to get around Almelo, is to do like the Dutch do, and go by bicycle. You can hire them very cheaply in the city. 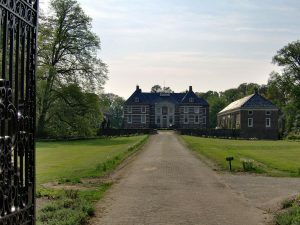 The castle or Huize Almelo is worth going to see. It is right in the centre of the city, but as the family still live there, you are not able to go in the building, but the view from the surrounding gardens is very good. The Stadsmuseum Almelo is a good, local museum. It has some nice paintings and a lot about the history of the area, especially the late 19th century and the 20th century. Het Wevershuisje is an exhibition, based in a small cottage, it has many things to do with the weaving trade. And there are regular demonstrations as well. De Galerij Is a good shopping street that is protected from the weather by a glass roof. They have some great shops there, but they tend towards clothes shopping and boutiques. Winkelsluiting is a shopping and fashion mall. They have some great shops and it is also a good place to get away from the rain while you are shopping. If you wander round the back streets you will find some very good local boutiques and other owner run stores and also some more eclectic and very interesting shops. Dock 19 has good Dutch food and a comfortable interior. It also has attentive staff who will help you choose, by explaining dishes to you. Overall very friendly, with good food at a reasonable price. Nielz is a very relaxing bar and restaurant. It is not a posh restaurant, you can get a very reasonable meal from the bar for just a few euros and also their specials are usually well worth a look. Zuid is a local sushi restaurant. It has a good selection of fresh food and the service is very helpful. The menu is not huge but the food is good and what you would expect from a quality sushi restaurant. The Akropolis is an upmarket Greek restaurant that is not usually overcrowded, but has a nice atmosphere and very good Greek food. Also prices are good for the standard of food that you get. Almelo is an interesting place to go to and can also serve well as a touring base for the Twente area. It is a former industrial city but is making good strides towards the future as well.